As the day gets dark, Trivandrum (officially known as Thiruvananthapuram) like any other city, turns much busier and happening; with people flocking towards their homes after busy schedules. These are times when we witness the streets turning out more active with all the major shops, markets, the prominent restaurants and also the fast food chains turning out very busy. But then there’s something one would definitely not miss in spite of all these- the roadside eateries or also popularly known as “thattukadas” that has a long legacy of delivering us our favorite delicacies. When we look back to our history, what one would definitely miss is the long lost traditional tea shops or “Chayakadas’’ that had its own place in our culture. It would be difficult for the younger generation to relate as they were born into a time when restaurants and fast food culture slowly started taking hold of these spaces. But the older generation would definitely have an emotional connection with these spaces where people who belonged nearby gathered in large numbers at least once in a day and discussed everything beneath the sun while also relishing their favorite dishes. These spaces definitely had its own place in forming our culture. The beginning of the 90’s witnessed the restaurant and fast food culture slowly taking hold in our society, thereby introducing various cuisines. Cities like Cochin and Trivandrum at that time were the first to witness this massive change which eventually led to many restaurants opening up at different places. 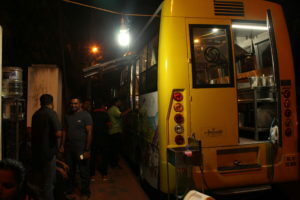 But what also gained popular at that time was the roadside eateries or “thattukadas” that emerged out as an innovative concept; where dishes could literally travel to places and also could be prepared live in front of the customers thereby allowing people to enjoy their all-time ‘tea shop’ favorites as well. 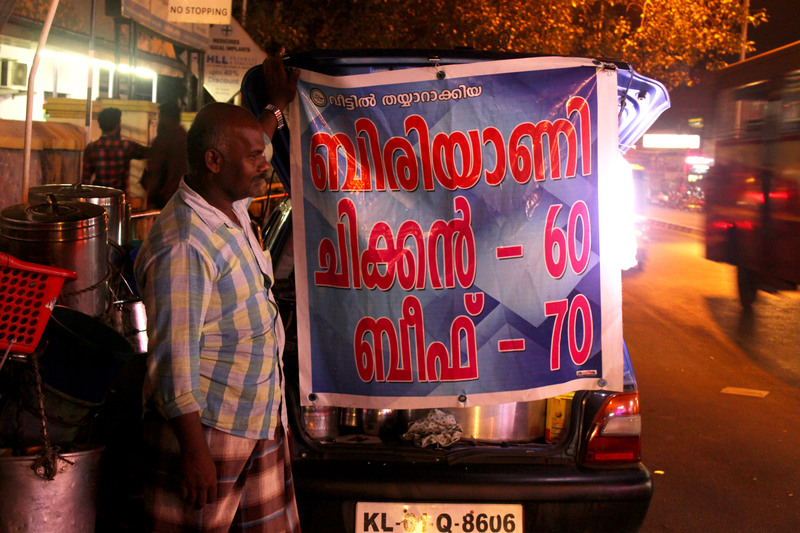 Trivandrum as when compared to many other cities do not have dedicated streets for food. The local eateries here are mostly widespread. Also, most local eateries do not function throughout the day but only during evenings and late nights. But still, these particular areas that host thattukadas mostly turn out very busy during the night times with most of them serving till 11:30- after which they cannot function as per the Corporation rules. Some of the areas that host ‘thattukadas’ in the city are Bakery Junction,Vellayambalam, Vazhutacaud,Karyavattom, Statue, Sasthamangalam, Kuravankonam-Kowdiar stretch,Pattom, Ulloor- Medical college stretch, Paruthippara, Nalanchira, Mannanthala and many more that mostly function from 7 pm to 11 pm. 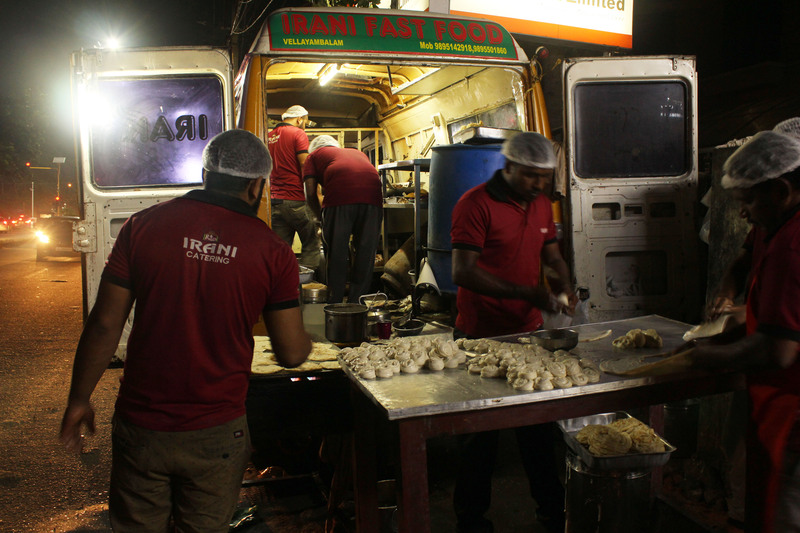 Kannan, who works at a local eatery in Bakery Junction says “ We have been here for more than 20 years and the eateries here in Bakery Junction have been functioning from a long time, with these mostly being run as a family business inherited from one generation to other. And now, it’s our turn as youngsters to look after the business”. Dosa is one of the main items that dominate in the menus of most, with the plump Dosa-Chutney-Rasavada-Omelet-Pappadam combo being the USP of most of the local eateries around Trivandrum. While some others go to the extent of adding Idiyappam and Puttu along with Chappathi, Parotta, Chicken fry and beef items alongside the popular combo in their menus. An interesting food stall in Vellayambalam is “Makachiyude Payasakada” that offers different kinds of Payasam on almost all days in a year. Preethamol, who runs Makachiyude Payasakada says “We mainly offer 4 different varieties of payasam at Rs 20 and also a special one named ‘Navarasam’- which is a combination of 9 items including various dry fruits and other stuff priced at Rs 30. 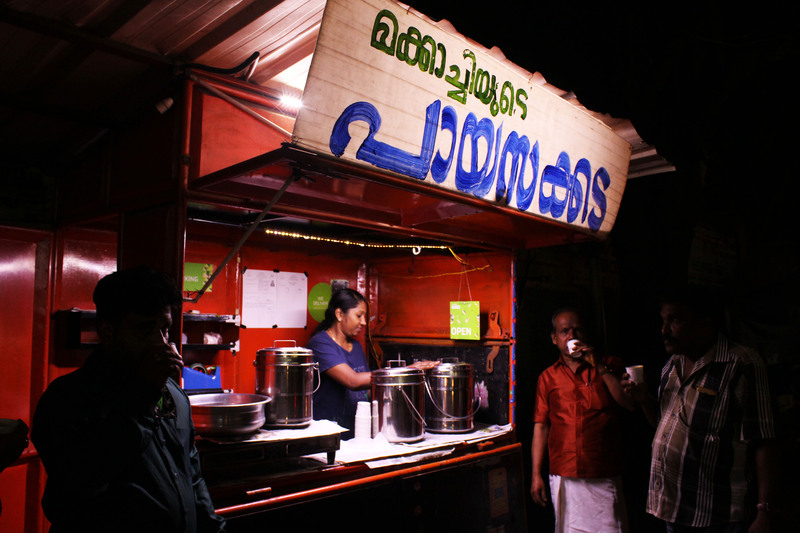 We already have signed in with Uber Eats through which the payasam gets delivered in 0.5-litre containers to homes as well.” Navarasam is their USP as the name excites anybody who would visit the stall and many would try it out of curiosity. As innovation finds its place in each sector, things are no different as far as street food is concerned. One of the main attractions in the city is the emerging food trucks and vans that have arisen to compete with the ubiquitous thattukadas in the city. While some serve similar food items to that of the thattukadas, some go to the extent of experimenting with new dishes out of traditional items. Spice Wheels, a food truck at Kuravankonam is known to be experimenting with different types of dosas like Spicy club dosa, chicken dosa that comes with chicken or beef fillings is a must try dish at great prices. Other prominent food trucks in the city are Jacob’s Pitstop near Technopark, Aadya’s Tasty at Pattom, Bismillah, Keerthi and Nattu Ruchi(popular for fish items) near Tagore Theatre, Vazhuthacaud, Burger Band at Kazhakootam, Alif Mahal and Irani at Vellayambalam. Out of these, Alif Mahal and Irani are popular among people as they have been functioning in the city for more than two decades.“We have been functioning in the city for more than 20 years and have a whole lot of a regular customer base. Out of all others dishes, Parottas and Beef fry are our USP’s and we do have centers at Poojappura, Karamana, Vellayani and Nanthancode” says Abbas, the chief chef, and owner of Irani who is popularly known as ‘Irani Abbas’. Keeping in mind the irresistible aroma, lot of people including families flock into these eateries at evenings for relishing fast foods that are served hot at decent rates when compared to most other hotels in the city. 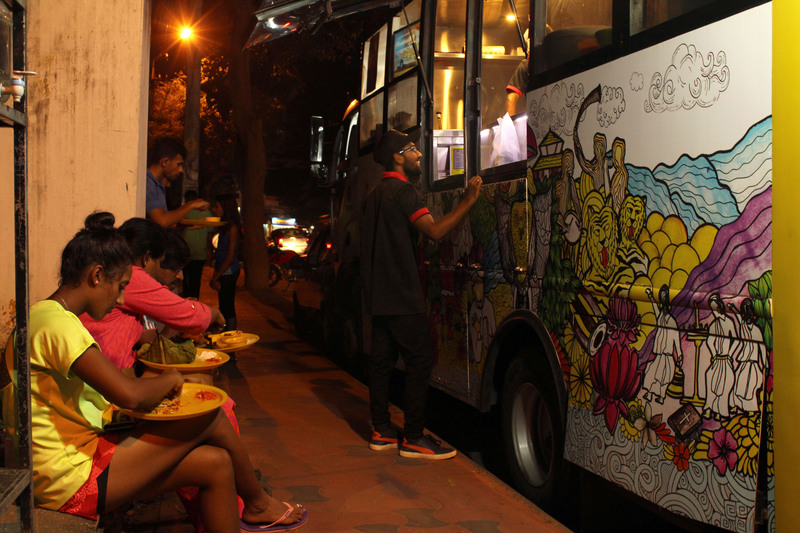 It’s interesting to see how some of these food trucks provide options for public reviewing in Facebook groups like Food Encyclopedia Trivandrum and EAT-Eat at Trivandrum, that provides a common platform for foodies around the city to interact. Anjana Gopakumar, who works as the marketing coordinator at Uber Eats and also being one of the admins of EAT, says she’s always been a foodie and a fan of street food as well. ”Street food in Trivandrum is something which we all associate to home, this city’s street food is nothing fancy, it’s all about everything you can recreate at home, budget-friendly, pocket-sized home food out on the streets,” says Anjana who’s also a food blogger. One can also find dedicated shops and stalls not only for food items but also for thirst quenching drinks as well, with Trivandrum’s own Buhari’s Special varieties of shakes, Kulukki sarbath, Sugarcane juice, Spiced sambharam, Naruneendi Sarbath, Nongu juice,Bonji Vellam(Lemon Juice) and our very own Tender coconut water being some of the popular drinks in the city. Bismi Stall, near Palayam Mosque, offers one of the best Naruneendi sarbath and Fruit sarbath in the city. Also, a shop on Kurissadi Junction at Nalanchira, popularly known as Davidettan’s Kada serves our typical Bonji Vellam aka lemon Juice which is a must try. If one were to take a list of many of the local eateries around the city where good food is served, then that would be endless. 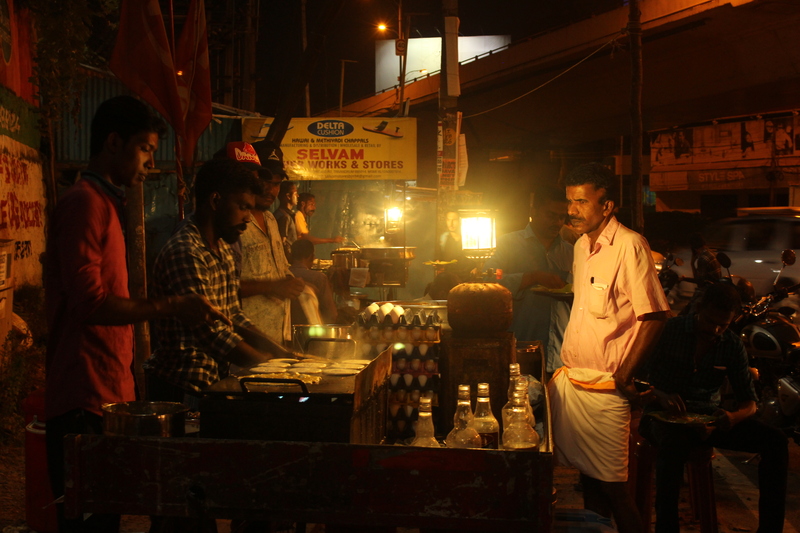 Indeed, the increase in street food options around the city is a great sign of the vibrancy and youthfulness of Trivandrum.